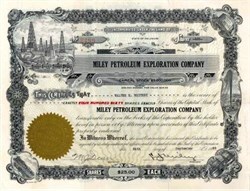 Beautifully engraved certificate from the Miley Petroleum Exploration Company issued in 1929. This historic document has an ornate border around it with a vignette of an oil field. This item is hand signed by the Company’s President and Secretary and is over 73 years old. The company was involved the the cout action 18 Cal.App.2d 182 Miley Petroleum Corp., Ltd., v. Amerada Petroleum Corp. December 17, 1936. Civ. No. 1784.